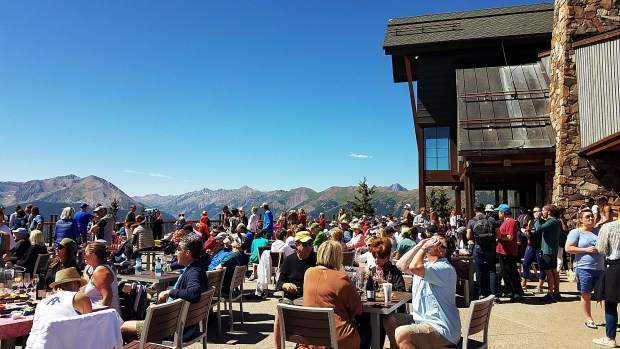 Hundreds of people went to the top of Aspen Mountain on Monday to watch the solar eclipse from the Sundeck. 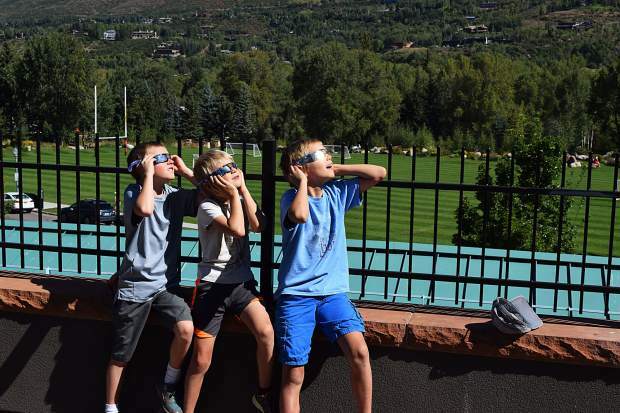 A group of youngsters from Marble view Monday's solar eclipse from Galena Plaza. 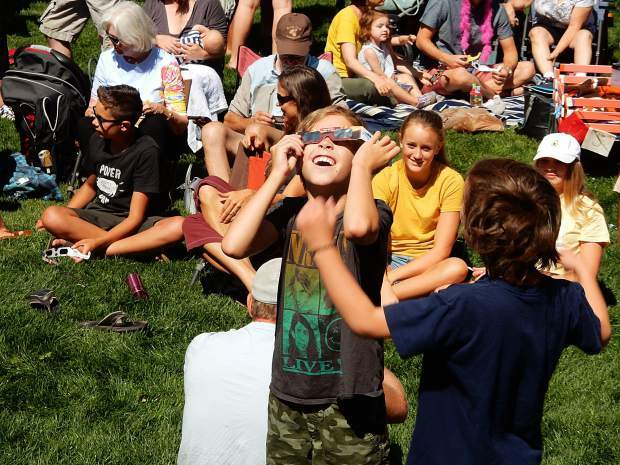 Glasses and smiles were a common sight Monday as a crowd gathered at Basalt Regional Library to view the Great American Eclipse. 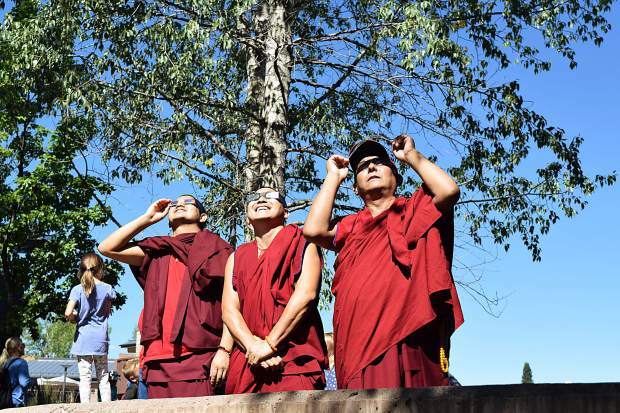 Monks of the Gaden Shartse Monastery check out the eclipse Monday in the outdoor area near the Pitkin County Jail, which is near the viewing party held at the Pitkin County Library. 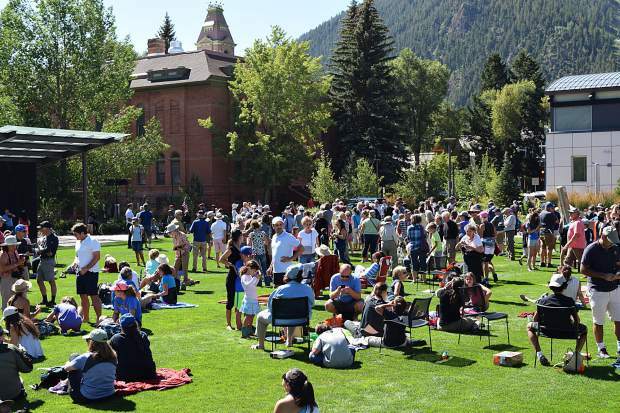 Viewing the solar eclipse through a telescope was the preferred method for many who flocked to the Galena Plaza to take in the eclipse party staged by Aspen Science Center and Pitkin County Library. 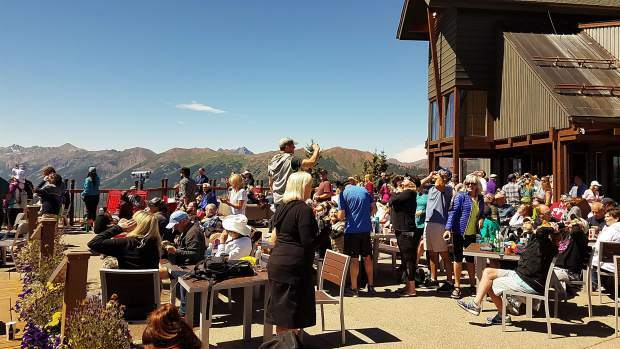 Hundreds of eclipse-watchers went to the top of Aspen Mountain on Monday morning to check out the event from the Sundeck. 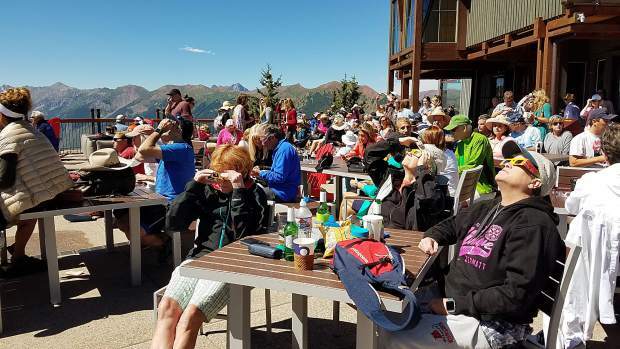 Eclipse glasses were in high demand Monday at Galena Plaza, where the Aspen Science Center and Pitkin County Library hosted a viewing party that attracted hundreds of gatherers. 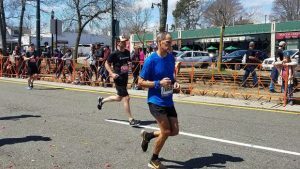 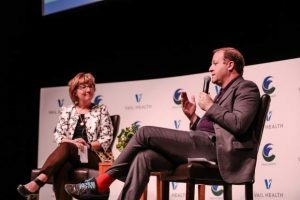 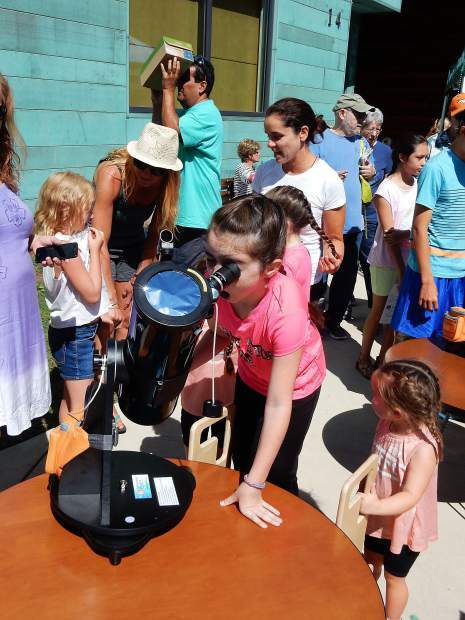 The Science Center distributed more than 1,000 pairs of special viewing glasses, said David Houggy, the nonprofit's executive director. 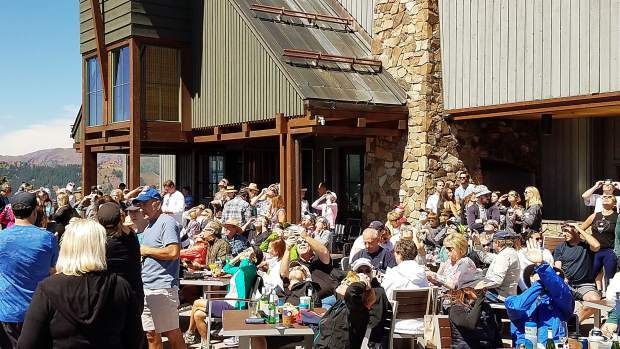 Galena Plaza was a big draw for viewers to take in Monday's solar eclipse. 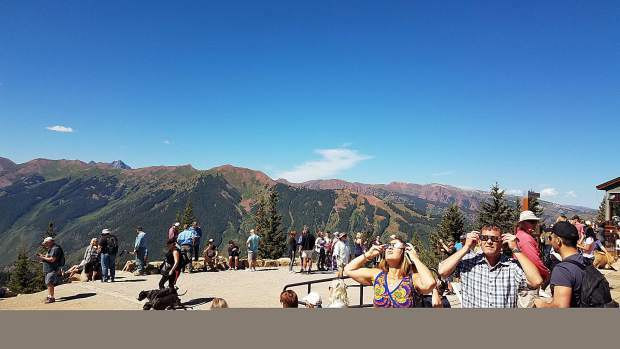 The Aspen Science Center handed out more than 1,000 pairs of special viewing glasses to observers. 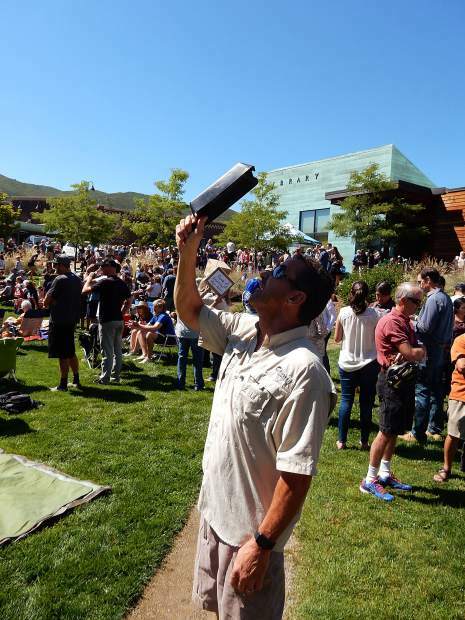 Spectators started collecting on the lawn of the Basalt Regional Library at 9:30 a.m. Monday for the Great American Eclipse event. 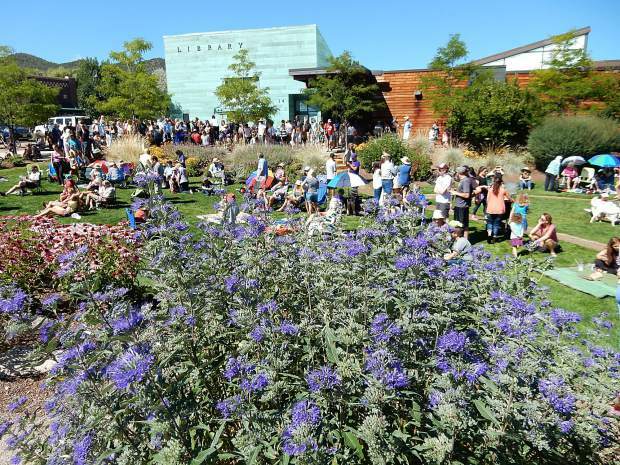 Hundreds had gathered by prime time. 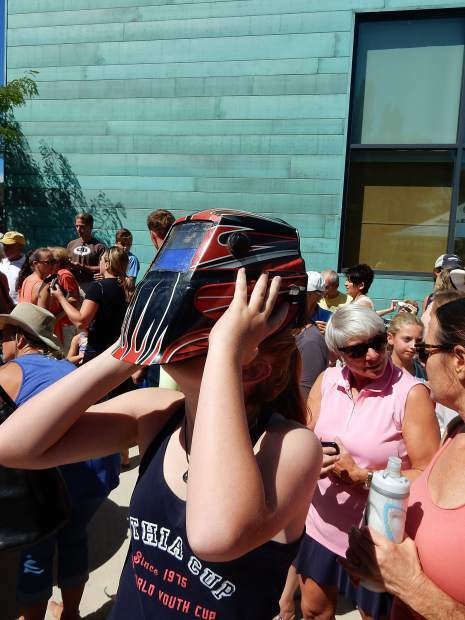 A young eclipse viewer dons special eyewear at Basalt Regional Library. 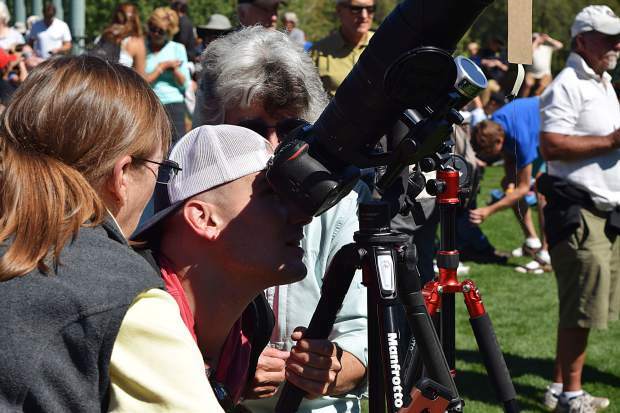 Lines were long to gander through three telescopes set up outside Basalt Regional Library Monday to view the Great American Eclipse. 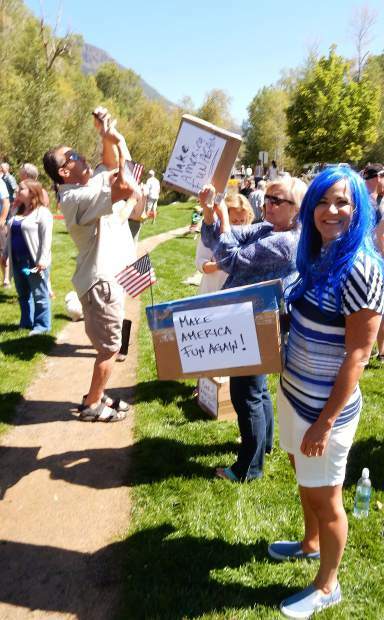 A spectator uses a box with a pin hole to check the eclipse's progress at Basalt Regional Library. 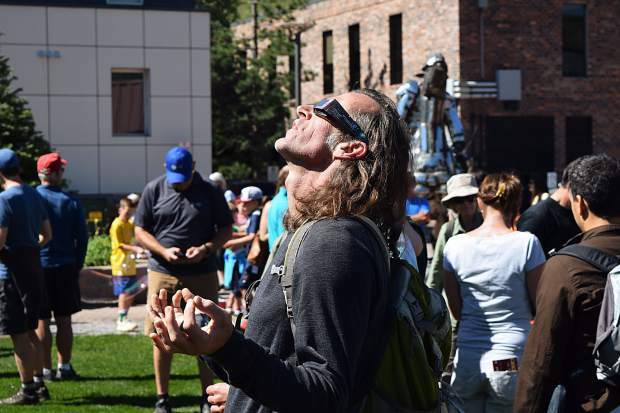 An eclipse watcher strikes a common pose seen Monday at Galena Plaza. 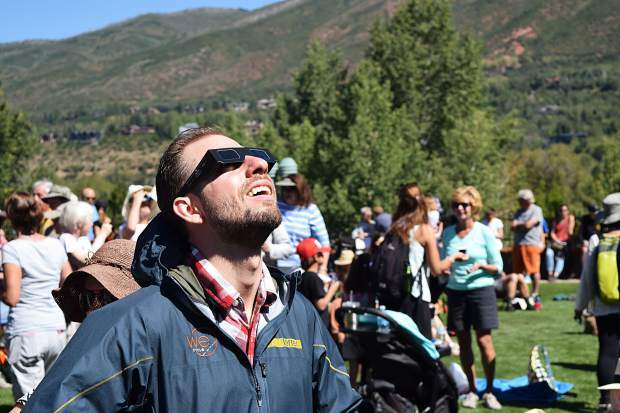 Aspen resident Monte Love revels in Monday's ecliptic event put on by Aspen Science Center and Pitkin County Library in the Galena Plaza. 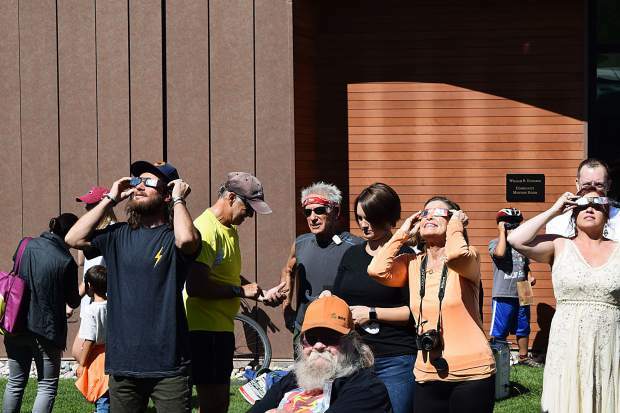 A spectator checks out the view Monday from Basalt Regional Library. 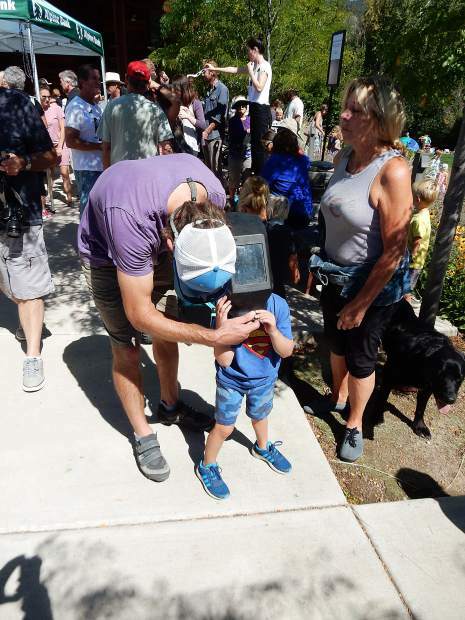 A young viewer checks out the eclipse at Basalt Regional Library on Monday. 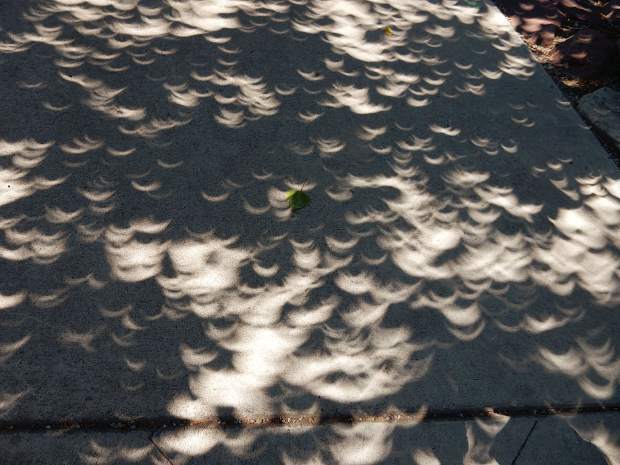 Freaky shadows were abundant during the eclipse. 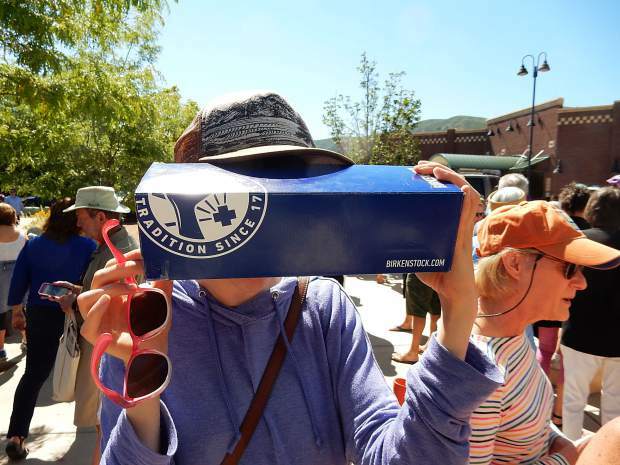 Spectators took turns using special glasses to view the Great American Eclipse on Monday at Basalt Regional Library. 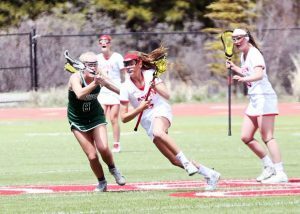 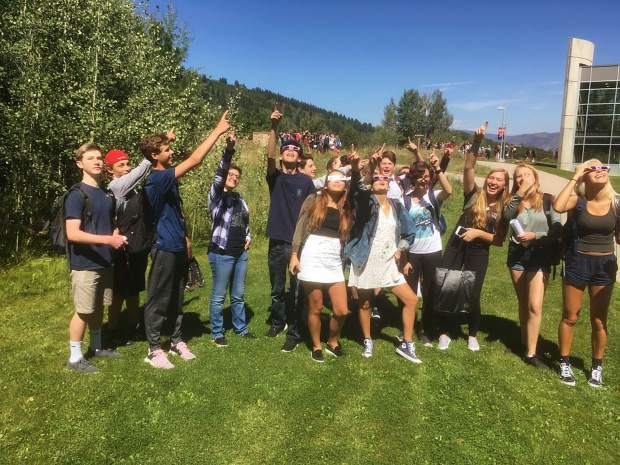 Armed with special glasses and some curiosity, Aspen High School students started off the year Monday by taking in the solar eclipse. 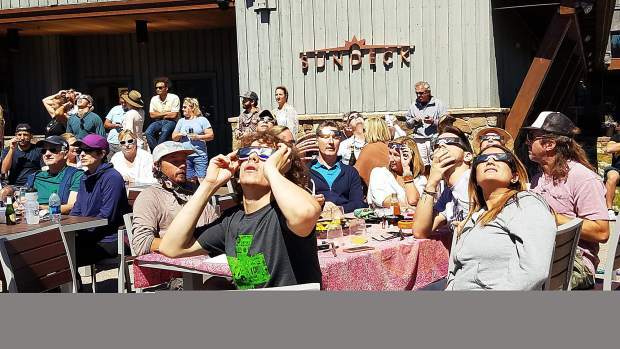 The Great American Eclipse rolled across Aspen and the Roaring Fork Valley on Monday and thousands went outside to catch a glimpse of the solar event. 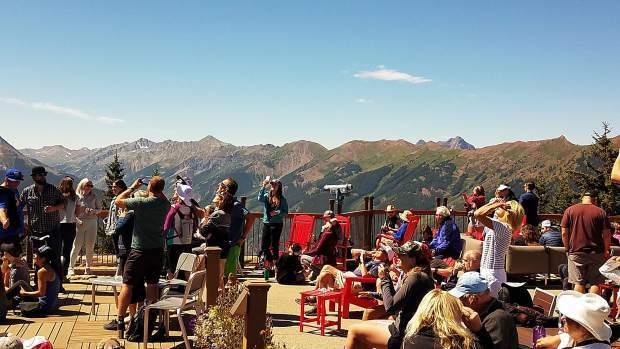 From the top of Aspen Mountain to the Pitkin County Library and groups at the Basalt Library, resident got out to look up. 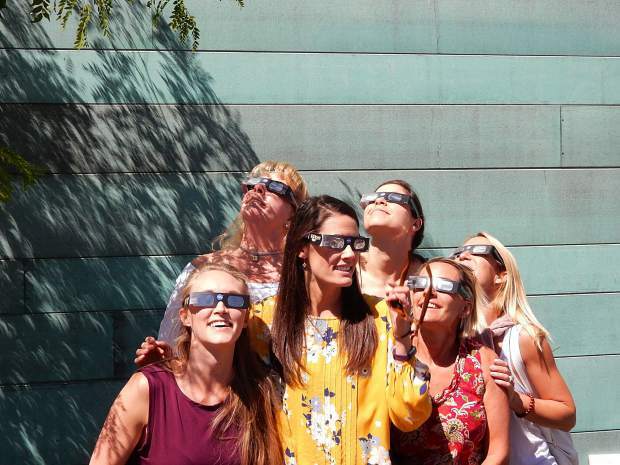 From about 10:30 a.m. until 1 p.m. there were many people taking a break from work and their normal Monday routine to check out the skies.